Howdie folks, welcome back. How is the new year treating you? I can’t say that I am back in the swing of things yet. I am still longing for lazy days sipping hot chocolate on my couch. But alas reality is different, work has to be done and obligations need to be fulfilled. But to make things a bit easier on myself I indulged a bit and bought myself a sweet bouquet of flowers. And guess what?! They ain’t white! But my flowers are sweet and pink and make me so happy I can almost forget that it is yet again raining outside. So come on in and check out my winter mantel decoration…. This is just a bunch of grocery store flowers. Nothing fancy and in fact I consider these carnations to be pretty old fashioned flowers. But what is wrong with a bit of old-fashioned he, I’m no Spring chicken anymore either. As you can see my collection of white vases is growing. There are some dollar store vases up there, a silver one that is now spray painted white and a collection of ketchup and sauce bottles that got a spray tan too. Oh and I brought the French mirror back in too. This mid winter month I need all the light I can get so a bit of extra reflection is a good thing. Of course I divided up my bouquet of flowers and spread them all out. It is a sickness I think, I don’t seem to be able to keep a bunch of flowers together. Something in me always wants to separate them and then group them together again. What is that do you think? this need for flower diversification? this un-bunching of the bunch? this need to compartmentalize the bouquet? Do you think I need to see a doctor about that? If you need more evidence of my insistent need to spread out my flowers look at this pale pink tulips arrangement, or my brightly orange flowers in bottles one, or my summer mantel project from 2011 that was even specifically designed to split up flowers. Or maybe I just like to separate my flowers because I have an excuse to use more pretty containers? Or maybe it is my mantel subconsciously telling me that it wants a horizontal decoration. Whatever it is, I like it and I’ll happily embrace my bouquet-splitting madness for many decorations to come. Especially when my flowers are as hot pink as these…. So what is your post-Christmas decor looking like? Going for a winter (that would be summer Down Under) look? Going bare? Skipping right through to Valentines? And what do you think? Am I in need of some serious psychological help, or should we just form a bouquet splitting fan club? You’re flowers are lovely. I really like the splash of color! Yeah, me too. The hot pink brings a smile to my face every morning when I walk into the room. Love the soothing calm from the white and the pop of color! from God to spread the beauty. Ah that is a nice thought I am spreading the beauty!! Love that. I love those adorable lanterns. Bouquet splitting….I hope none of those flowers were in a relationship. A forced separation might be truly difficult. You’ll need to look for droopy heads. 😀 All silliness aside. 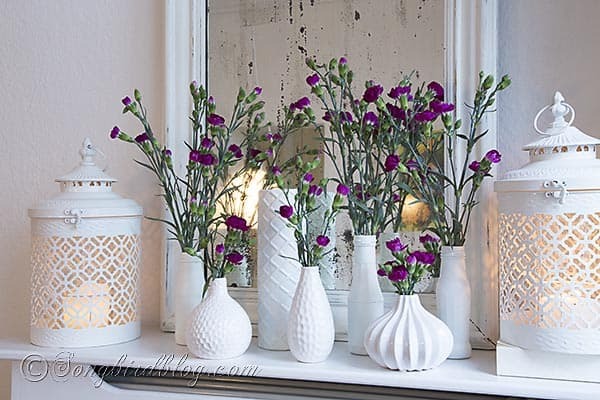 It’s lovely…and how fun to add to the array of vases with a few common bottles, er…vases that is, too! I love flowers too! They add so much to your home. Your vases are so pretty and will work with any color you choose, right? Love your current ones! I think that is a great idea you have there! It really spreads out your flower decorating dollar and makes the once-scrunched up bunch into lots of smaller ones. Really, you can see each flower better that way too. I am addicted to spray painting vases and jars….that’s a good strecher of dollars too. Morning Marianne, I agree with Ellie’s comment. I like the idea to unbunch only to bunch again. Having the mirror reflect more light, the two white lanterns, candles, numerous white vases, and the color of the petite flowers, you truly have an artistic eye. And your photos are great! Thank you for sharing with us. Great mantle vignette Marianne, love it! The photography is great too, you did an amazing job with the lighting, esp. with these more-dark-than-light days we are having in middle Europe. I always have such a hard time photographing things this time of year! Everytime I visit your site, I get “light” inspirated! Thanks. Yes the light is definitely a challenge these days. Gotta pick the right moment and then some post-processing doesn’t hurt either. Thanks for stopping by and saying hello, it is much appreciated.